The FFT for the Vrms shows explicitly on the screen that there is around a 6.25kHz noise on pink plot. But on the bottom right of the screen there is another frequency shown in yellow color as f = 96.2818kHz. What is the meaning of that frequency? 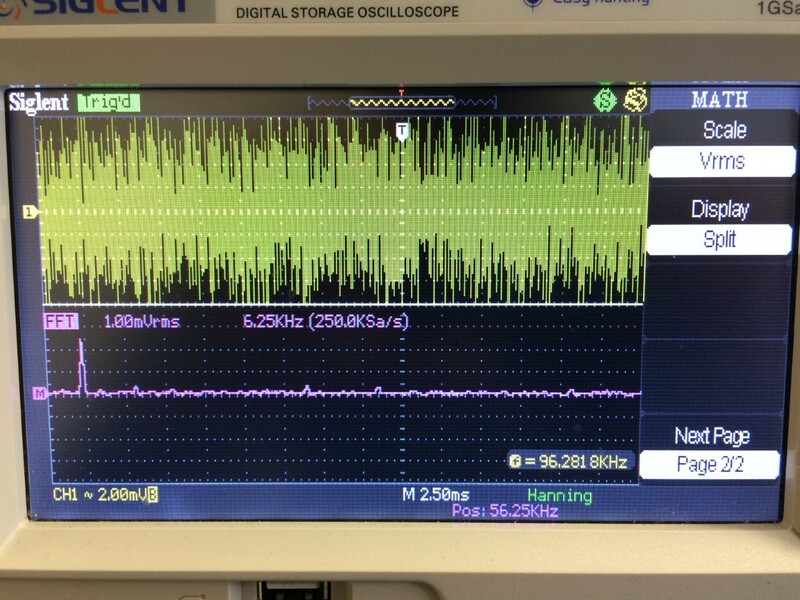 Educated guess - it is range of FFT display from 0 (left) to ~15 segments * 6.25 kHz = 93.75 kHz (right). Rotating the respective knob you must be able to change the scale. Ok, I was proven to be wrong, and looking to manual I see no direct clarification how to interpret the data. Do not ask me how scope measures it; may be it takes some "prevalent" frequency of noisy signal, or it uses some AI to guess what you want displayed frequency to be... As a test - use scope's calibration output (usually of 1 kHz) and this yellow f= will show exactly 1 KHz. How to calculate RMS of total noise from digital Oscilloscope (FFT)?